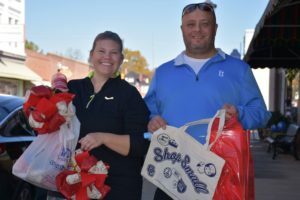 Kim and Kristen Andrews from Smithfield participate in the Shop Small Selma Event in 2017. The event returns this Saturday, Nov. 24th from 10am until 2pm. Uptown Selma, in partnership with American Express, has signed up to participate in this year’s “Shop Small Saturday” which is held annually on the Saturday after Thanksgiving. This year marks the second year that Selma will participate and the BIG day to SHOP SMALL will be Saturday, November 24 from 10 am until 2pm. Neighborhood Champions from Selma have come together to participate in this special day and to encourage shoppers to visit the Uptown Selma Shopping District of Raiford, Anderson, Webb, Waddell and Railroad Streets. Some 27+ small businesses plus a “Pop Up Market” with some direct sales and a number of hand-crafted vendors will be set up along the sidewalks of Uptown Selma. All have agreed to participate in this year’s “Shop Small Selma” event. Shop Small is a movement encouraging people to shop at small businesses BEFORE going to the big box stores. Millions of individuals, businesses, and communities have embraced it not only locally, but nationwide, as more and more people are realizing the importance of supporting their local economy and the businesses that support the activities in and around the town they live in and do business in. In 2010, American Express founded Small Business Saturday to help the local, small business owners with their most pressing need – getting MORE customers. The single day has grown into a powerful movement, and more people are taking part than ever before as they realize they should “Shop Small Before Going Big”. Buying local benefits our communities in a variety of important ways, including retaining money in our communities, generating jobs, increasing community involvement and helping to retain Selma’s “uniqueness” of railroads, antiques and fun activities. A fun way for consumers to participate in Shop Small Selma, is to come to Uptown Selma and get your”PASSPORT” from one of our three welcome stations located in front of Selma Town Hall, the Selma Visitor Center (on Anderson Street) or Hayden Wiggs Gardens (next to For Pet’s Sake on Raiford Street) and then get going! Each participating business will give a stamp on your passport and once full, you can enter it for a chance to win a gift basket filled with goodies, deals and coupons from the Selma and Pop Up Businesses. Extra entries are given when you spend at least $20 at participating businesses. Santa’s elves will be on hand at the welcome stations for photo ops, shopping help and general all-around merriment. The winner of the basket will be announced at the Selma Christmas Tree Lighting Ceremony and Parade to be held on Tuesday, December 4 starting at 6pm. Get to know your Local, Small Businesses and SHOP SMALL, SELMA!